Happy Valentines day everyone! 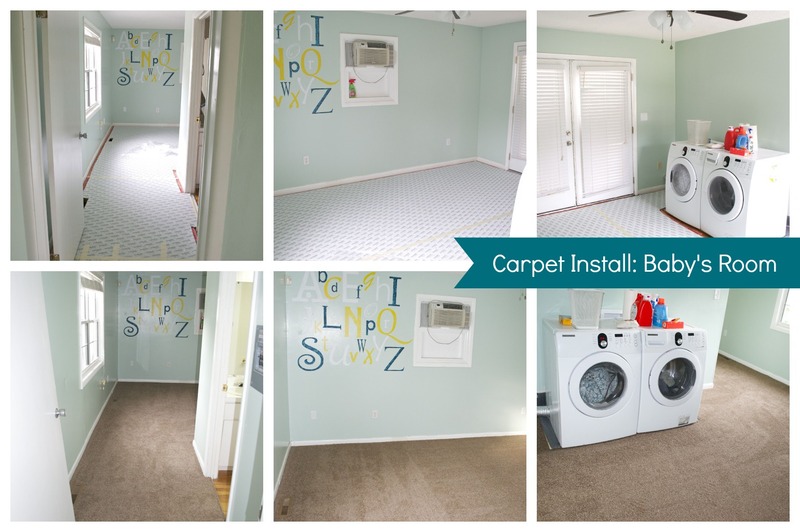 Today I'm sharing with you something I've been waiting for for a really long time... carpet install! I know that generally, people like hardwoods over carpet, and while in the majority of the house I would agree, I personally prefer wall-to-wall carpet in the bedrooms. It's just cozier and nicer on your feet. Even though I LOVE carpet in the bedroom, I HATE getting carpet installed. This is the second time we've gone through the carpet installation process, the first time being in our first house. That time we used Home Depot and had issues with buying the carpet as well as issues getting them to our house to measure. Despite the issues, we initially were going to go with Home Depot this time as well (sometimes we just don't learn). This time, there measurement program they use apparently wan't very smart and so wouldn't use scrap pieces to fill in the very small closest we have and therefore they were going to charge us for an extra ~30 sq ft of carpet just to do those little closets (which was just ridiculous to us and meant we weren't using the other scraps so we were going to throw out ~70 sq ft of carpet). After Nate tried to explain to the measurement company how this would be easy to take care of since we weren't installing carpet under the washer and dryer, it became clear that they didn't understand and so they said they would talk to the install company and call us back. We also found out at that point that it was going to take about 3 more weeks for the carpet to be installed (we were about a week into the process). We were fairly frustrated at this point so we headed over to Lowe's with our floor plan to see if we would have the same issue over there. After explaining the situation and what our issues were, we were happy to find out that they also thought it was ridiculous to not use the scraps for the closets. 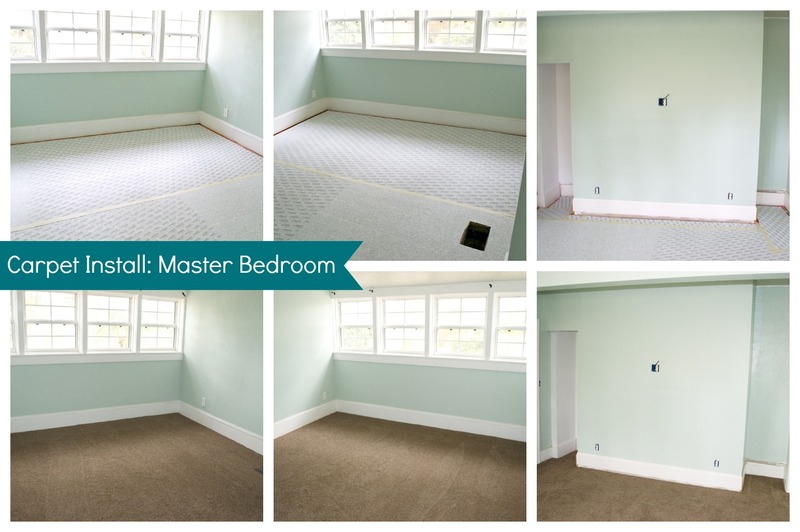 The better part was that they had StainMaster carpet instock (which was a better carpet than we had picked out at HD) which meant that after the measurement was done, they would install the carpet within 72 hrs. So, while we were waiting to hear from HD, we decided to get a measurement from Lowe's. Within two days they came out and measured (their program had no issue with using scraps) and by the time we even got a call back from HD, we had the measurement and an install date. Three days later the carpet was installed! We also were able to get a StainMaster pad (better pad) and the combo was about $100 less than HD would have been. The only thing with Lowe's was that they would have charged to put the tack strips down, but they let you put your own down if you want, so the night before install, Nate spent about an hour putting down tack strips. 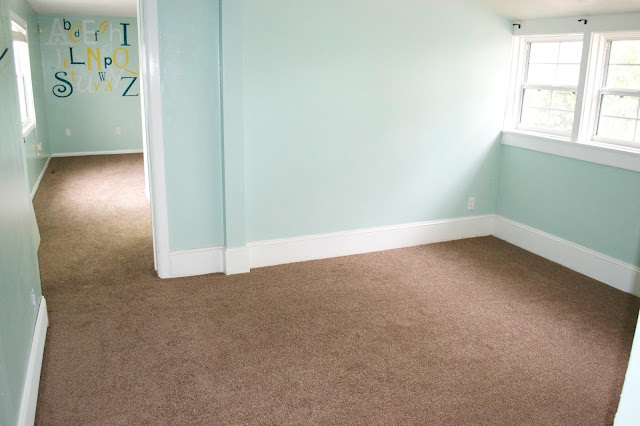 Despite the issues we had with getting the carpet installed, I love how much the carpet changed the feeling in these rooms. The carpet is so nice to walk on (and lay on) and the rooms are so cozy now. The rooms also feel so much closer to being finished. This is my favorite view right now.